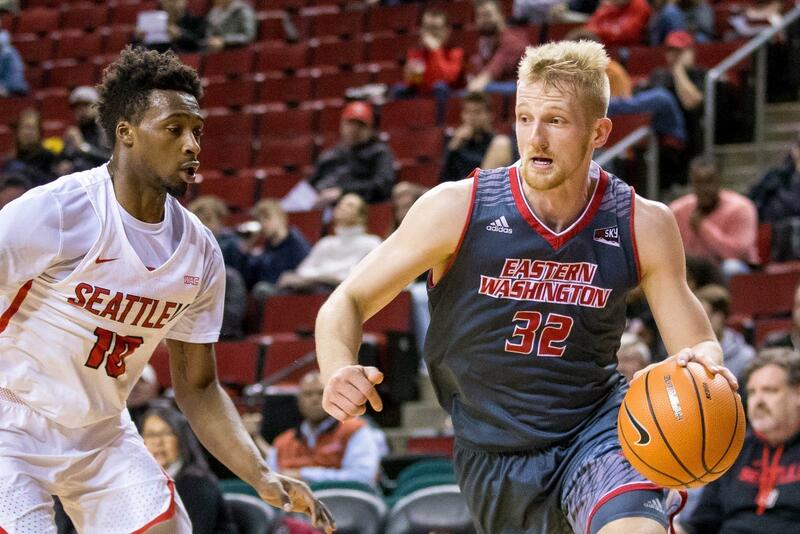 After climbing to fifth on the Big Sky Conference career scoring list, the Eagle senior Eastern Washington senior guard/forward Bogdan Bliznyuk captured his third weekly honor of the season in home wins over Montana and Montana State. Bliznyuk averaged 22 points, 7.5 rebounds and seven assists to help Eastern improve to 14-13 overall and 9-5 in the Big Sky. Bliznyuk also jumped four spots on the conference top-10 scoring list to reach 1,969 points, just the second player in league history to reach that mark in the last 24 seasons. The Lutsk, Ukraine, native began the week Thursday with 19 points, six rebounds and five assists to hand Montana its first league loss in a 74-65 decision in Cheney. Bliznyuk finished 8-of-13 from the floor in all 40 minutes against the Grizzlies. Bliznyuk followed with a 25-point performance in an 84-79 win over Montana State on Saturday. ​On the week, Bliznyuk shot 53.3 percent (16-of-30) from the field while going 11-for-11 from the free-throw line. Bliznyuk has now made 63 consecutive free throws dating back to Dec. 31, ranking first in the Big Sky with a 90.7 percentage (137-of-151). Bliznyuk is just 10 free throws shy from tying the NCAA single-season record of 73 set by Villanova’s Gary Buchanan during a 21-game stretch in the 2000-01 season. Published: Feb. 19, 2018, 10 a.m.